(From left to right): Anaz Ahmad Tajuddin, Group Head of Engineering for AirAsia & AirAsia X; Shamsul Kamar Abu Samah, Head of NAICO for Ministry of International Trade and Industry (MITI); Captain Dato Fareh Ishraf Mazputra, CEO of Asian Aviation Centre of Excellence; Tan Sri Tony Fernandes, Group CEO of AirAsia, Nick Leontidis, CAE Group President for Civil Aviation Training Solutions; Alexandre Prevost, CAE Regional Business Leader; Mark Strasser, Canada Acting High Commissioner and Senior Trade Commisioner and Benyamin Ismail, CEO of AirAsia X Berhad at the official launch of the new A330 CAE 7000XR Series full-flight simulator today. The ceremony was officiated by Tan Sri Tony Fernandes, Group Chief Executive Officer of AirAsia and Nick Leontidis, CAE Group President, Civil Aviation Training Solutions. It was also witnessed by dignitaries from the corporate partners and the public sector. This investment represents an important step in positioning AACE as a premier institution in aviation training within the region. AACE supports pilot training needs of more than 35 airline customers through the delivery training courses including type-rating on Airbus A320, A330 and Boeing 737NG platforms. The CAE 7000XR Series FFS is the next generation of CAE’s industry leading simulators, which offer unprecedented realism and are used to train pilots in a full array of situations and environmental conditions. 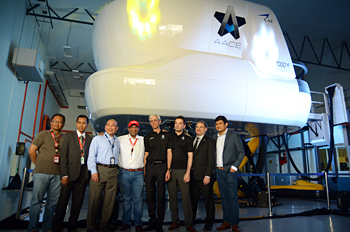 The simulator is the highest generation simulator in the world, installed by CAE in Malaysia. Leveraging the latest advancements in technology and training capabilities, the CAE 7000XR Series is designed to optimize life-cycle costs and addresses new and future training requirements. Enhanced features include a re-designed instructor office with support for mobile devices and real-time data analysis and feedback. The CAE 7000XR Series is also equipped with embedded training capabilities to address Upset Prevention and Recovery Training (UPRT).